C'mon, you can admit it, you wanted to wake up one day and discover you were royalty. This would lead to you getting whisked away in a fancy car, to a gorgeous palace full of cool clothes, hundreds of rooms, and a library full of books with secret nooks to read in. Just me? I don't believe that for a moment. And luckily Meg Cabot will back me up on this. 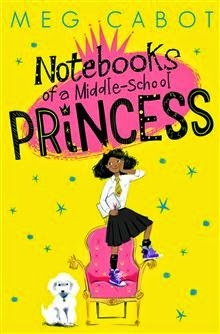 Her Princess Diaries series has already been phenomenally successful, and now she's turned to a slightly younger audience with a new series, starting with Notebooks of a Middle-School Princess. Olivia Grace is completely normal, living with her aunt's family, going to school everyday, and hanging out with friends. Until one day, she discovers her half-sister is Princess Mia Thermopolis (yes, from The Princess Diaries). Olivia is thrust into life as a princess, but that doesn't mean her old life is behind her, as she soon discovers. Cabot has created a really likeable, relatable character in Grace, who is smart, funny and talented - she loves to draw, and Notebooks of a Middle-School Princess is full of illustrations, drawn by Cabot, that add an amusing and casual edge to the book, as well as letting us know a bit more about Grace. Cabot presents Grace as a normal teenager, one who is confused when someone she thinks is a friend turns on her, and one who gets excited by every new experience. Just like The Princess Diaries, Notebooks of a Middle-School Princess is appealing because of the friendly tone, and the fun at the centre of it. That doesn't mean the book doesn't have a serious side. Cabot touches on death and grief, on crime, betrayal, race, and on what it means to be a family, but the way she does this isn't heavy handed, and I think is appropriate to the age group this book is for. Young teenagers won't feel patronised or talked down to, because this book is honest and forthright, without being an issue book, and, to use the word again a number of times, it's fun, fun, fun. •Notebooks of a Middle-School Princess is out in the UK on May 21, 2015. How I got this book: From the room of books at work.